I spotted that Yen did an “all you can eat” Sushi night which cost around £18 per person (excluding drinks) so I thought lets try it as I love Sushi. I have never been here so this was my first time, and on entering its very nice inside. The waitress tried to explain how it works, but still I was a little confused and just crossed many boxes. When she saw it, she then explained again which made sense…so…. You get 7 rounds to order food (not really all you can eat, but you should be full by at least round 4 or 5). I only managed 2 rounds, but the first was a big one as I got a lot. This was a lot of Sushi and very very filling, the last part for me Maki I didnt really enjoy that much but I did really like the hot food and the Nigiri. Overall I cant really fault here, was it value for money….for me no but if you get more Sushi then yes it is!!! The sushi was all very fresh, and very tasty so if you love a lot of sushi then check out the unlimited sushi nights at Yen. A while ago I saw here doing a competition on their Instagram account, I never win anything my luck isn’t that good but I thought lets try it and see what happens. It was to win a £20 voucher. I did what needed to be done to enter and thought nothing else, until I was closing up for work and I got a notification on my phone and woohoo I won. I was very shocked as I said I never win anything, most I’ve ever won was £1 on the lotto so this was very cool. It took me till now to actually go and use it, but was it worth the win and wait? continue reading to find out. Today I was drinking a lot of water, and had a late lunch so I didn’t order too much. I am a fan of prawn crackers from any place, so this as a little snack while the main gets made is perfect. The darker crackers are Thai crackers, these are amazing and packed with a nice slightly spicy flavour and have more of a crunch to them. The dip that came with them was a nut dip, I couldn’t take this as I can’t take nuts but am sure it would be nice if you are a fan. This for me was a very random option, I would never order this normally but since I had a voucher I thought lets give it a shot. When it arrived it looked nice, but it really smelled good…my only issue was chop stick! not Kris friendly or should I say Kris isn’t friendly with them….I really need to learn so I used the big spoon and tried my best. To be honest apart from the struggle to eat it for me (but thats me), there wasn’t really a strong fish taste to this dish. The broth part and noodles were very nice. Overall this was good and very filling, would I get it again…maybe but only once I learn chop sticks. I tried the other 2 beers last time so this was last to check out. It was a very light beer, and an easy to drink beer. Finally I got round to using my voucher, and I tried a dish I normally wouldn’t have so it was a good evening. 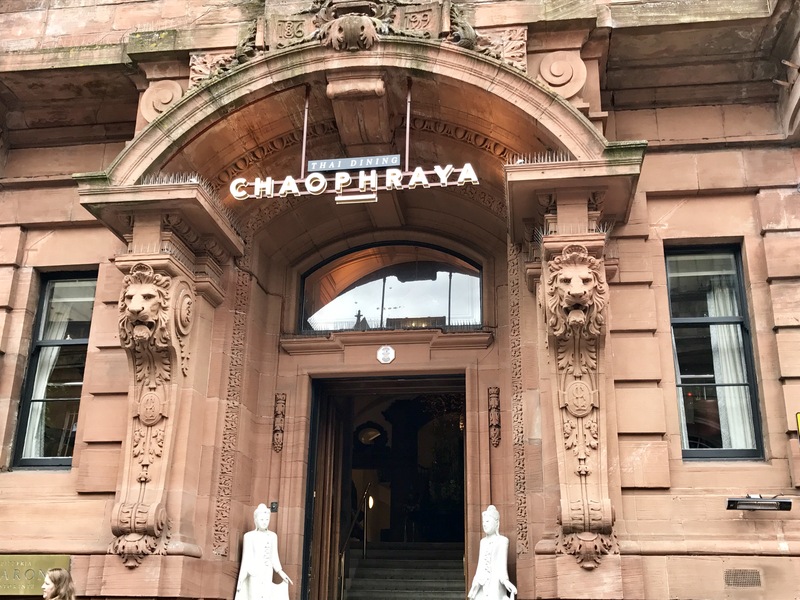 I have not been to Chaophraya (Glasgow) for a very long time, I think it was when it first opened and then once maybe twice for cocktails at its Palm Lounge bar. If you have never visited here you are in for a treat, and I am talking about a visual treat to start with. From the outside it just looks like an OK building, but when you enter you are transported to a warm rich Thai interior. When Chaophraya took over this building they spared no expense, the interior is amazing and everywhere you look its filled with amazing statues, paintings etc etc and this isn’t just for the entrance hall its the same on every floor. I spotted that here was doing a Thai Afternoon Tea, and I do like my Afternoon Tea’s so I had to buy the Itison offer and see what it was like. This was £19 for two and anything else you order like coffee, coke, food is an extra cost on the day. On arrival this was very nicely presented, and it looked very nice and tasty. Munch munch munch and done. Everything that was served was very full in flavour, and very very moreish!!! I still felt a little hungry after it but that’s just me, but I enjoyed this so much I looked for the offer again but it was finished….but keep watching as I heard its very popular and it will be on offer again. My favourite from the selection was the duck in the hirata bun, I wish there had been more of this as it was so good. Overall my return visit was very good, I was very relaxed and enjoyed the Afternoon Tea. If I was to be fussy I could say there could have been more scones (these we, also I heard a few people ask for more jam and cream also offer plain scone as some people don’t like fruit scones………..and maybe more cakes but that’s just being too fussy and greedy. I enjoyed this and will be keeping watch for the offer again.